Liberal? Conservative? Not politics as usual. 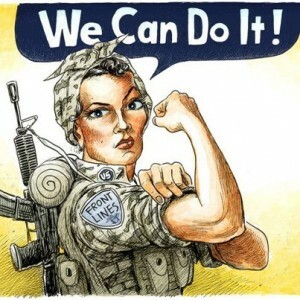 A little over a week ago, the Pentagon announced that under Defense Secretary Leon Panetta, they are lifting the 19-year ban on women serving in front line combat positions and potentially elite commando jobs. The decision opens up some hundreds of thousands of potential job positions for women in the military, and could come to include positions in the Navy SEALS and the Army’s Delta Force. When I first heard the news, my reaction was twofold. First, I was a little surprised–surprised that the decision came down and curious to know if there really were thousands of women currently serving in the military who were waiting to enter the front lines. Second, I was certain that, what some saw as progress for women, others would see as an assault on the gender roles between men and women and as an attack on the military, as a whole. Separation of Church and State: Yea or Nay? I know I don’t talk politics much here on Modern Reject. Truth be told, I am a political junkie and I have to temper myself, otherwise this blog would become a veritable political buffet. All that to say, sometimes something so juicy, controversial, titilating and downright hilarious ensues that it begs to be discussed. After watching the video, you will see that the yeas and nays were basically equal. Some have argued that the nays were a bit louder and more boisterous at the end. Then we see poor Antonio Villaraigosa, the Convention Chairman, bang the gavel and push through a proposal to include “God” (and Jerusalem as the capital of Israel) into the Democratic party platform despite the obvious opposition to such language. The takeaways are many. Political blogs and news sources are having a hay day with this one–Republicans and Democrats alike. The religious and irreligious are also foaming at the mouth. I, for one, just want to hear what you think. I’m not here to play politics or to try and persuade anyone one way or the other. But one of the proverbial questions this whole debacle has raised is whether or not the separation of church and state is American? More than that, is there room for God in politics? Do you think God should be included in either of the political party platforms? If God was removed from politics (as desired by those who voted nay at the DNC) what do you think would be the result? Let’s discuss. Let’s debate. Let’s be kind, respectful, and have fun.